Since the beginning of the military operation in late-2016, thousands of civilians were forcibly displaced, many more were killed, wounded and maimed by violent attacks and airstrikes, hundreds were used as human shields, and countless men, women and children were tortured, threatened and arbitrary killed by both governmental forces and ISIS fighters. Furthermore, following months of siege and terror, civilians were forced to leave all their belongings behind to seek refuge in makeshift shelters and camps – poorly set up by the Iraqi government, which failed to provide basic services and to ensure the safe return of displaced persons. 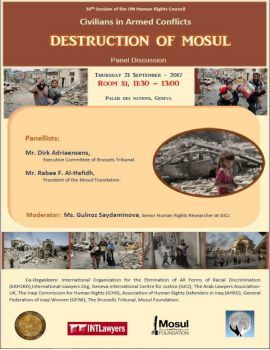 In light of the grief losses among civilians in Mosul and the almost total destruction of several parts of the city, as well as, of the dramatic loss of artistic and cultural heritage in the city, this side event aims at shedding light on the responsibility of the international community and at identifying viable strategies for the reconstruction of the city, ensuring justice and accountability for its citizens. The international community has, also, the legal and moral duty to intervene and to lead concerted efforts to ensure reconstruction and reparation.